Bonn, 24th October 2014 – In the frame of the Tiger Helicopter Programme, OCCAR-EA has awarded a contract to CAE Elektronik GmbH to undertake an analysis of the training needs of the Bilateral Tiger Technicians Training School. Six French Hélicoptère d’Appui et de Destruction (HAD-F), the newest TIGER helicopter generation, were delivered to France in 2013. TIGER Maintenance Trainer Declared “ready for training”! 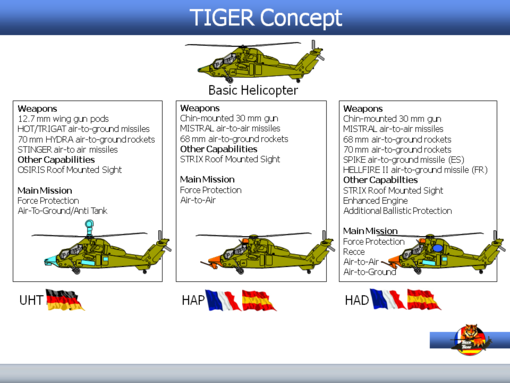 On the 08th of May 2012, the Tiger Maintenance Trainer (TMT) has reached “ready for training 1”. For the Support of the TIGER Weapon System a major milestone was achieved with the signature of the Repair Frame Contract (RFC) with ECT.